We’re always so pleased when we hear from customers who have opted to use our products for their projects. When we received an email and some impressive before and after photos, from one such customer who had used color restoring Polytrol to restore his garage door, we’re not exaggerating when we say that there was an audible buzz of appreciation in the Owatrol office as we took in the transformation. It was then that we knew that we had to share how Brian (our happy customer) had achieved this result, so that our other customers could benefit, too. If you want to replicate Brian’s success, it’s important to ensure that your garage door is clean and free of any dirt, grease, mildew or grime. A bit of elbow grease and a bowl of warm, soapy water is usually all you’ll need to do the job. However, if there’s any mildew on your garage door, just scrub on a 50:50 bleach and water solution, leave it for about 10 minutes, then rinse it off. If you have any polishes or waxes on your garage door, you will need to remove these too. Before moving on to the next step, ensure that your garage door is completely dry. 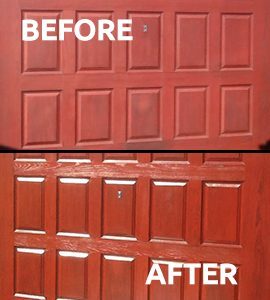 A deep penetrating oil, Polytrol works by penetrating the surface of your door and re-wetting the pigments, to restore the color that has been lost over the years, through exposure to pollution, rain and sunlight. Using a brush or a cloth and only working in sections that you can complete in 10-20 minutes, apply a liberal layer of Polytrol. As you work, if you notice any particularly matte and shiny patches, it means that the surface is absorbing Polytrol unevenly. If this happens, just move any surplus oil over to the matte areas. Allow the product to work for 10-20 minutes, then wipe off any excess with a clean, lint-free cloth. If you want a shinier finish, you can also buff the surface with a lint-free cloth. Now, you just need to leave Polytrol to dry. One of the great things about Polytrol, is that it has been designed to dry to a tough and long-lasting flexible finish but with no film, so you won’t need to worry about it peeling or flaking. In his email, Brian also said he “couldn’t have wished for a better result”. We have to agree – his garage door has been totally transformed. Have you used our products to complete a project that you’re particularly proud of? Get in touch to let us know and help our other customers to achieve the same results.